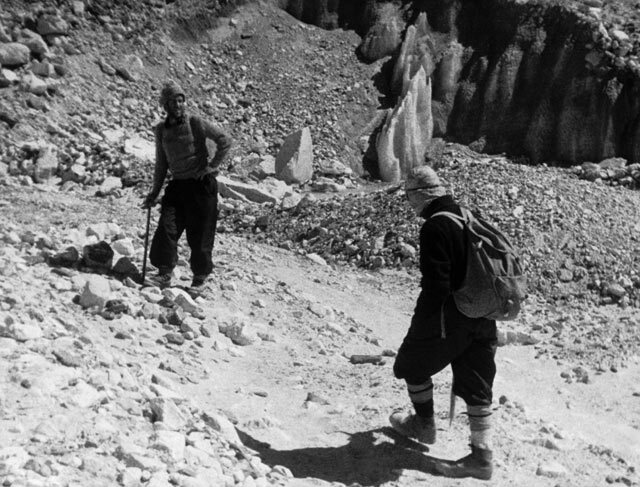 Sixty years ago, on May 29, 1953, a New Zealand beekeeper and a Nepali sherpa reached the peak of Mount Everest in Nepal. They were the first climbers known to have made it to the summit of the 29,000-foot peak. Sir Edmund Hillary and Tenzing Norgay made history that day, but they had a team of experienced climbers to support them. Here are some photos of this historic trek. 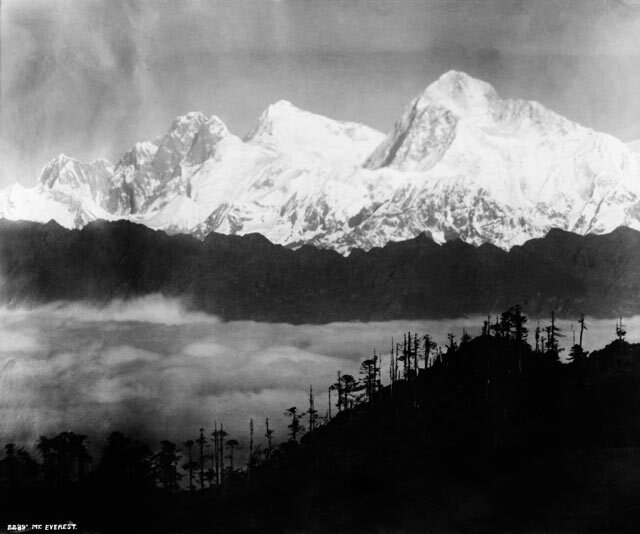 View of the snow-capped peaks of Mount Everest, the highest mountain in the world, Nepal, circa 1919. 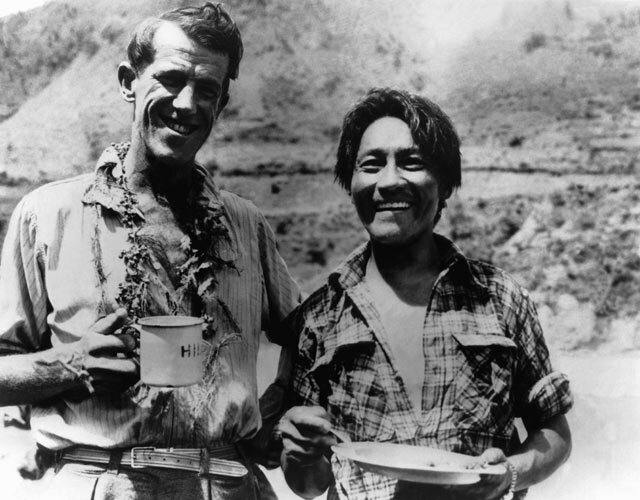 Edmund Hillary and Tenzig Norgay, drinking a cup of tea in the middle of the mountains just after they'd reached the summit of Mount Everest, June 20, 1953. 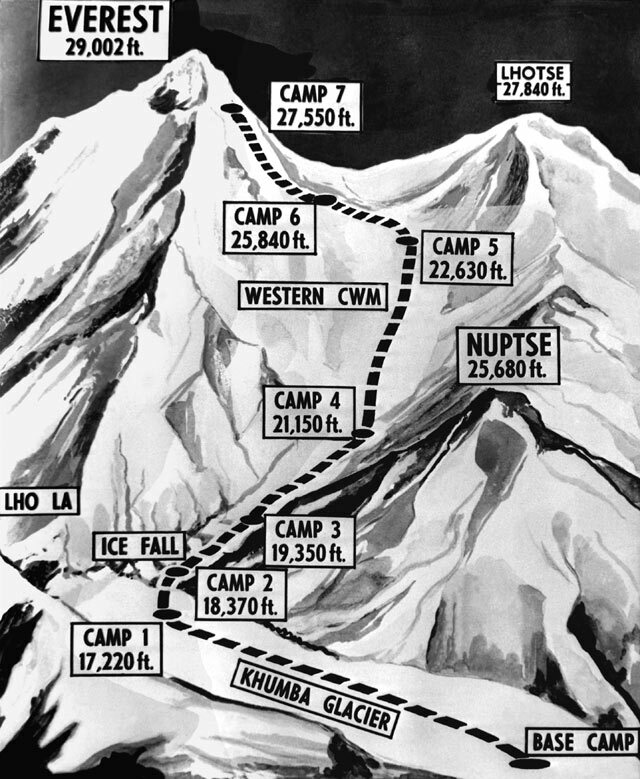 Edmund Hillary's route up the mountain during his first expedition to Mount Everest. He was the first to conquer its heights in 1953. Members of the British Expedition to Mount Everest, left to right, W. Noyce, M. Westmacott, T.D. Bourdillon, Major Wylie and R.B .Evans, and front row, G.C. 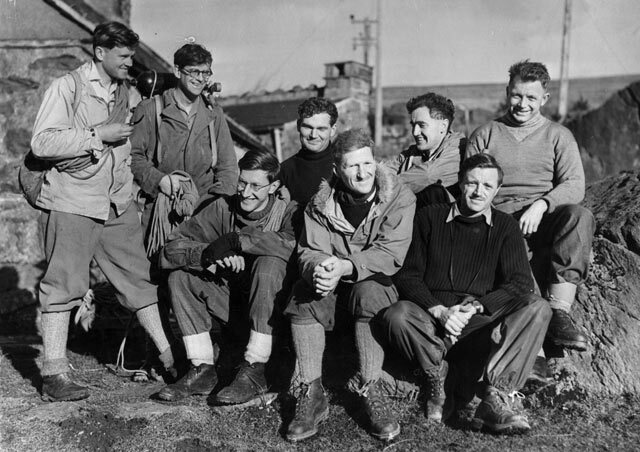 Band, Col. John Hunt and A. Gregory in Snowdonia, Wales, on Jan, 19, 1953, testing their equipment before departing to Nepal, to join with their colleagues, Edmund Hillary and Tenzig Norgay. 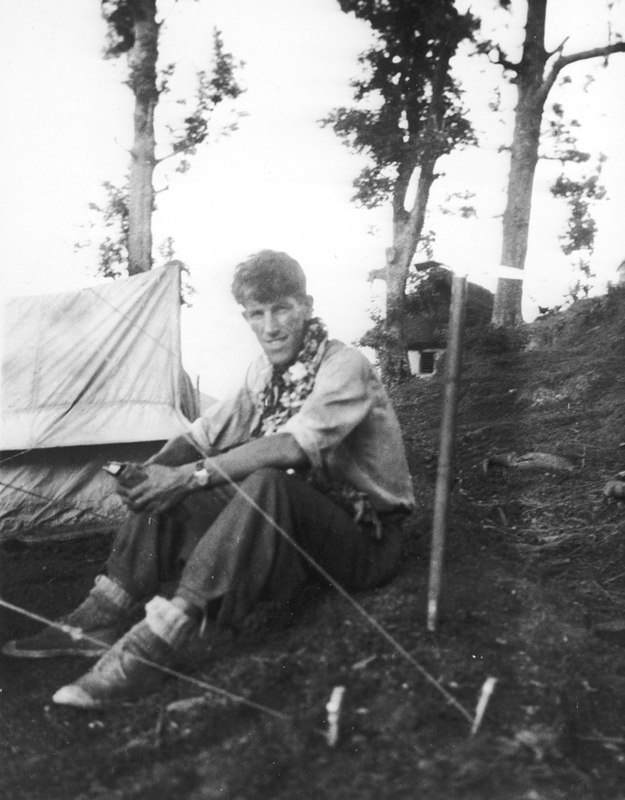 New Zealand-born mountaineer Sir Edmund Hillary sits at base camp, preparing for his successful attempt to be the first to reach the summit of Mount Everest, Nepal, May 1953. 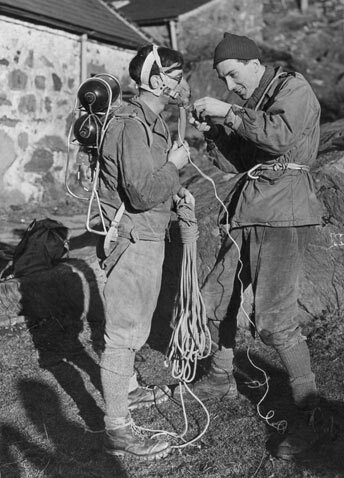 Mike Westnacott, left, wears oxygen cylinders as a Mr. Rawlinson helps him fix the equipment that they are testing on Tryfan in Snowdonia, Wales, on Jan. 19, 1953, before traveling to Nepal to climb Mount Everest as a part of Sir Edmund Hillary's mountaineering team. 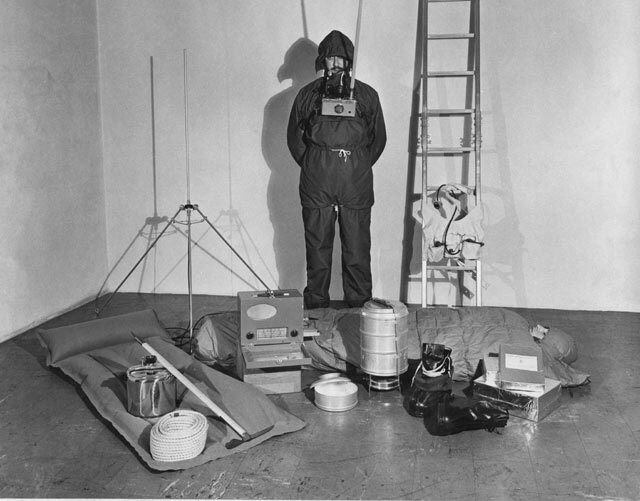 Some of the equipment used on Edmund Hillary's Mount Everest expedition, 1953. 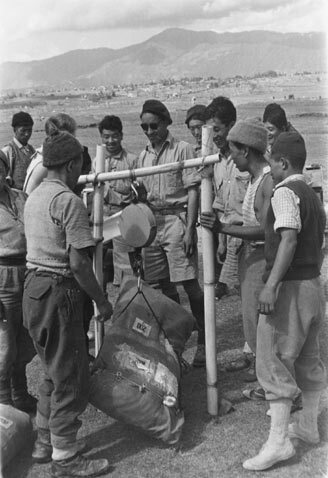 Sherpas weighing baggage before it is divvied up to be carried, at the base of Mount Everest on March 17, 1953, before the start of the Hillary expedition up to the summit. 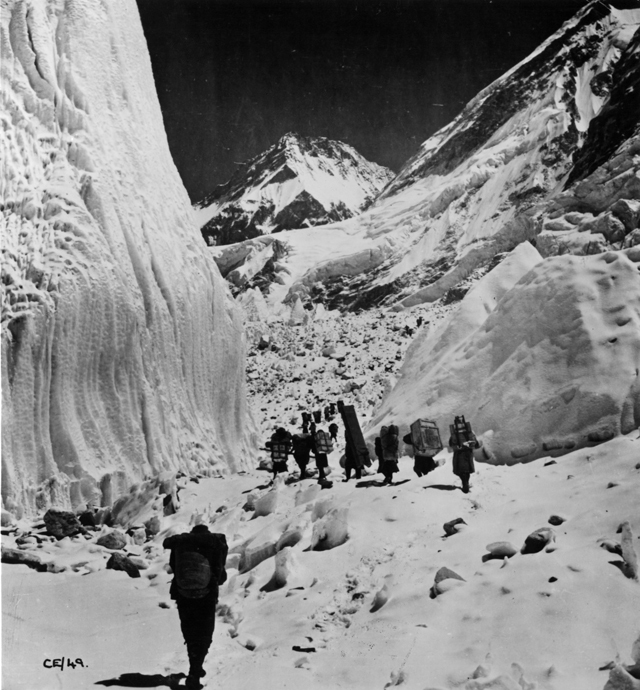 Porters on the way to base camp on the Khumba glacier move up the "trough" between large ice pinnacles, near Mount Everest, 1953. 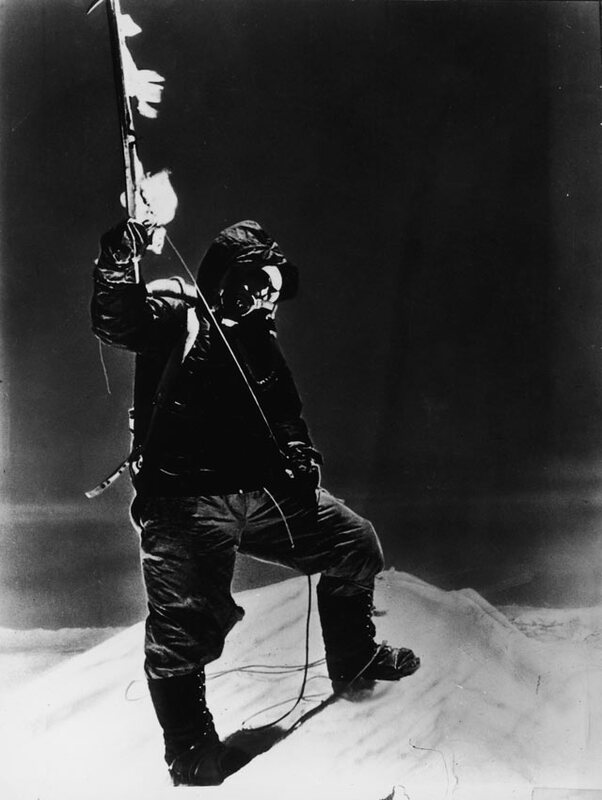 Mike Westmacott led teams of sherpas up the mountain ahead of the climbing teams to establish supply lines. The New Zealand climber Sir Edmund Hillary crossing the Barun glacier in the Himalayas at an altitude of 5,600 meters on June 16, 1953, after reaching the summit on May 29, 2013. Sherpa Tenzing Norgay holds an ice ax at the summit of Mount Everest, Nepal, on May 29, 1953. 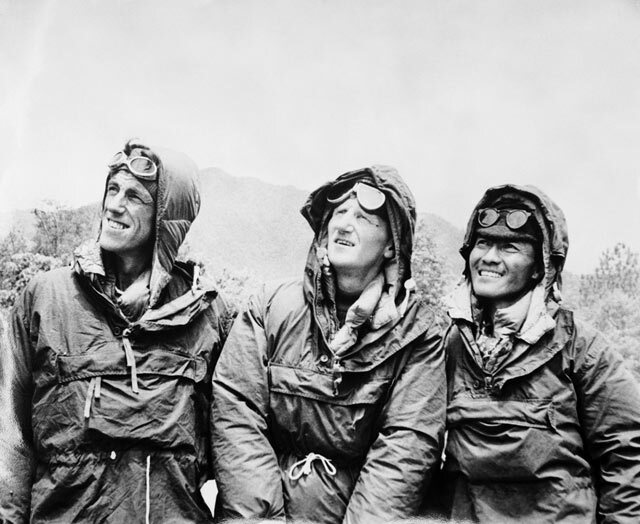 Edmund Hilary, left, and Sherpa Tenzing Norgay, right, with expedition leader Col. John Hunt, center, in Katmandu, Nepal, on May 26, 1953, after descending from the peak of Mount Everest. 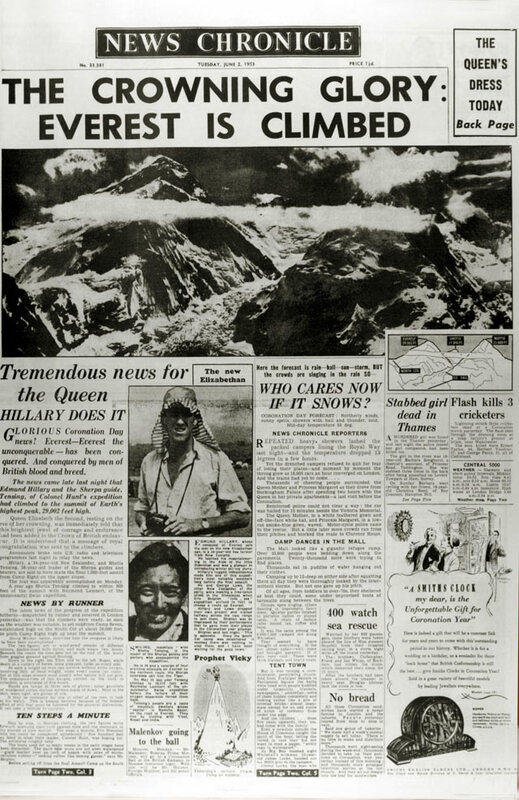 The June 2, 1953, front page of the News Chronicle dedicated to the first successful climb up Mount Everest when Edmund Hillary and Sherpa Tensing reached the summit on May 29, 1953. The successful climb came just days before the coronation of Queen Elizabeth II, and was announced to the citizens of London by newspaper boys hawking tabloids.